The comedian Hagen Range added his voice to Luther’s. It was the biggest Germany-wide celebration for the close of the Reformation Anniversary year. 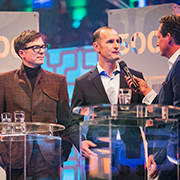 The Gala held in the Bonn Telekom Dome included prominent guests such as the television presenter Ralph Caspers, Football League trainer Heiko Herrlich and comedian Willibert Pauels, all of whom were able to bear witness to the fact that Luther is still an inspiration for today. 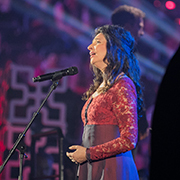 Everything falls quiet as the German-Iranian contralto Schirin Partowi raises her voice. She sings unaccompanied. The Bonn Beethoven Orchestra behind her remains silent, as does also the band up on the balcony and the 500-strong choir from the Bonn churches who are ranked up in tiered seats, as well as the five thousand visitors in the “Telekom Dome”, which is normally where the “Telekom Baskets” play their home matches. White beams of light from the mobile floodlights sweep slowly across the roof with its massive ventilation pipes. The camera cranes of the Westdeutscher Rundfunk (WDR = West German Broadcasting Company) slowly describe a circle above the heads of the people. 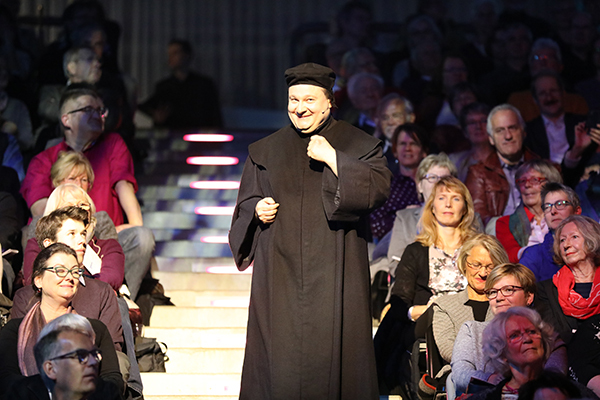 The Reformation Gala is coming to its end, the biggest German-wide celebration marking the end of the 500th anniversary of the Reformation. Schirin Partowi intones a hymn by Martin Luther: Graciously grant us peace, Lord God, in our time. The hymn was written in 1529 in the midst of fears of impending wars over faith. Today it serves to draw the different confessions together, since it appears both in the Evangelical hymnbook and also in the Roman Catholic “Gotteslob” (Praise to God). Following the contralto, it is the turn of the city’s Beethoven Orchestra. Starting with a staccato passage, there then emerges the melody of the Reformation hymn “Ein feste Burg ist unser Gott” (A mighty fortress is our God). The melody then transforms into the song for Europe which came from the pen of probably the most famous resident of Bonn, Ludwig van Beethoven. “Freude, schöner Götterfunken” (Joy, beautiful spark of divinity), a declaration of unity that crosses all boundaries. “All people become brothers wherever your gentle wings come to rest”. The message from Bonn says: where the Reformation divided believers, this anniversary is meant to bring people together. And encourage them to stand up together for peace. The fact that Luther is still an inspiration was the testimony of all the guest speakers, whether the TV presenter Ralph Caspers, the football trainer Heiko Herrlich or the lawyer Seyran Ateş, who has needed to be accompanied by personal bodyguards for eleven years because of threats to her life, and who in this Luther year has opened a Reform-Mosque in which men and women can pray together. 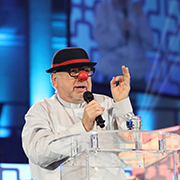 Three hours earlier the Gala had opened with another quote from Luther: “We are always on a journey and must leave behind what we already know and have, and seek for what we do not yet know and have.” The comedian Hagen Range added his voice to Luther’s. 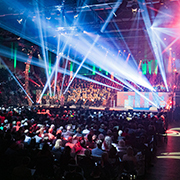 The German Music Council has published statistics that speak for themselves: more than half of the 1.4 million choral singers are actively involved in church choirs. This would not be thinkable without Luther, who belongs amongst the most creative hymn writers of all time right up to today. He wrote spiritual texts to be sung to the popular tunes of the day. Following his interview, the Barbadan-born singer Judy Bailey sang her hit song “Rise like a champion”, joined by the people down in the arena itself, where the champions are usually striving for victory, and extending up into the ten tiers of seating between the steep stairways, lit up in Telekom magenta. Luther no longer divides people but motivates them into action. 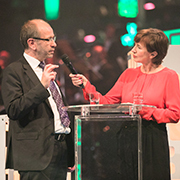 The Gala organiser, Revd Siegfried Eckert, said that 700 participants had worked together to plan and implement the Gala, of whom 600 were volunteers. 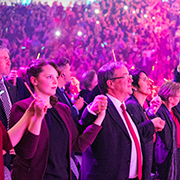 “This is a grass roots festival, a part of what it means to be an active Protestant.” As one of those responsible for events at the German Kirchentag, Eckert is familiar with large-scale formats. He has been involved in the preparations for four years. The Regional Church enjoyed the benefit of this, as did also the local church congregations. “But it took a lot of persuasion” said Superintendent Mathias Mölleken. Jakob Siegberg was very happy to be there. Two weeks earlier he had begun his Federal Voluntary Service with the St John’s ambulance service, and now he was standing up at the top by the entrance staircase, ready for action, and at the same time was also handing out lightsticks for waving at the end. And there was also Annemarie Gerster, which is not her real name. She did not want her name to be made public, as she thinks that others have done far more for the festival than she has. She belonged to the team of volunteers working with the Bonn railway mission. Today she had been welcoming the wheelchair users who came into the hall by way of the VIP entrance and taking them to the lift going down to the arena area and then to their seats.